Over the past 25 years, GeoEngineers has completed more than one million feet of trenchless projects, installed by horizontal directional drilling (HDD), Direct Pipe, microtunneling, Earth Pressure Balance Machine (EPBM) tunneling, auger bore and jack bore. GeoEngineers performs geotechnical investigations and makes recommendations for a range of pipeline infrastructure, including storage tanks and large-scale facilities. Our trenchless pipeline professionals are on the cutting edge of trenchless technologies. 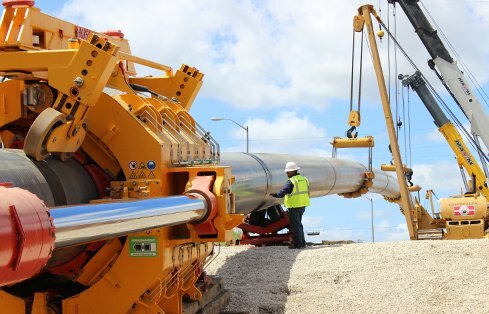 Here, they're using Direct Pipe® technology to install a pipeline in Port Arthur, Texas. 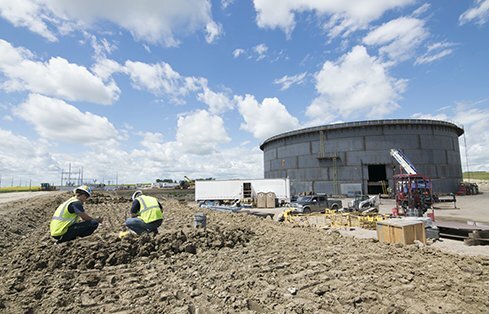 Large pipe diameter, concrete coating and the 5,780-foot distance made the HDD shore approach installation in Trinidad a world record. For more than 25 years, GeoEngineers’ expert staff has helped clients across the country plan, build and maintain their pipeline infrastructure. We are familiar with a variety of approaches and techniques, enabling us to custom-fit solutions to your pipeline site and requirements. In addition to our expertise in trenchless engineering design, we offer a talented team with experience in route planning, geotechnical engineering, permitting and risk management. Trenchless design refers to construction methods for installing new pipelines or rehabilitating existing pipelines in areas where traditional open-cut construction would not be permitted, practical or possible. Examples of typical trenchless technology applications include pipeline crossings under highways and railways, rivers and lakes, steep slopes, environmentally sensitive areas, city streets and other developed areas. GeoEngineers’ experts have completed more than one million feet of trenchless projects, and hundreds of horizontal directional drilled (HDD) pipeline crossings throughout the United States, Central and South America, Asia, and Africa. Trenchless Technology magazine has named GeoEngineers one of the nation’s top 25 design firms for trenchless technology for nearly a decade. Over the past 25 years, GeoEngineers has completed more than one million feet of trenchless projects, installed by horizontal directional drilling (HDD), Direct Pipe®, microtunneling, and auger bore and jack. We’ve become an industry leader in permitting and design for trenchless projects crossing beneath United States Army Corps of Engineers-regulated levees. Our horizontal directional drilling (HDD) professionals have a wealth of experience in planning, feasibility analysis, geotechnical engineering, permitting, designing and observing and consulting on construction of HDD projects across the country and abroad. From complex multi-state pipeline projects with dozens of individual HDD crossings, to projects that require installing pipelines beneath the Mississippi River without affecting critical levees—we’ve tackled some of the toughest HDD projects completed in the United States over the past 10 years. GeoEngineers has been at the forefront of Direct Pipe® trenchless technology since it emerged. This method combines elements of conventional microtunneling and horizontal directional drilling (HDD), allowing for a fully supported tunnel and a curved drill path, significantly reducing the depth of entry and exit pits and allowing one-pass installation. Because the drill path is fully supported, it can be installed at much shallower depths compared to HDD. 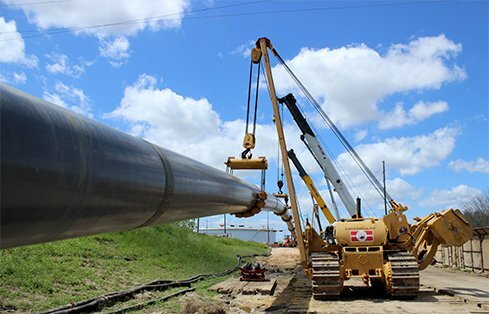 Our team designed and permitted the first Direct Pipe® crossing of a United States Army Corps of Engineers-regulated levee—a half-mile pipeline crossing under the Sabine Neches Waterway and levees in Port Arthur, Texas. To get this project successfully permitted, our staff leveraged their experience to develop a new engineering pressure model and pressure monitoring methodology for levees and other pressure-sensitive areas that could be affected by the trenchless crossing. 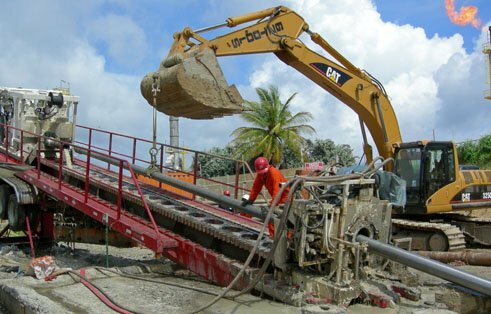 Detailed geotechnical and geological investigation and testing is the foundation of successful pipeline projects. Our engineers and drilling and geophysical testing crews characterize the soil and other geologic features of potential pipeline sites, identifying potential challenges and recommending an ideal placement and pipeline profile. GeoEngineers performs feasibility studies at the beginning of many of our projects to identify the most efficient methods and routes. We look for critical areas, such as wetlands or endangered species habitats, geological hazards, such as areas with landslide and seismic risks, infrastructure to avoid, and work with clients and regulators to evaluate the feasibility of various approaches. By evaluating potential hazards and potential approaches to each project through due diligence studies, GeoEngineers strives to reduce our clients’ risks. GeoEngineers uses a combination of methods to improve soil stability, including the design and installation of drains and various preloading strategies. We specialize in ground-improvement programs in soft soil and earthquake-prone areas. Our Performance-Based Engineering Team performs seismic analyses and numerical modeling to predict the interaction between soil and foundation structures during specific types of seismic events. Our Performance-Based Engineering Team has a wealth of experience with soft ground sites and seismically active regions. Our peer reviewed advanced modeling uses real-world seismic scenarios to model soil-structure interactions under different conditions. This approach can offer deeper predictive insight into how a pipeline structures might react to specific stressors. Our geotechnical engineers design shallow and deep foundations for pipeline facilities and associated infrastructure. We provide geotechnical designs, exploration, slope stability and buoyancy analyses, laboratory testing and engineering services for a range of structures, including above-ground product storage tanks, meter stations, large compressor stations, and equipment skids. In today’s regulatory framework, most pipeline and critical infrastructure projects demand integrated federal, state, and local permitting. GeoEngineers’ permitting professionals are here to help you create and implement realistic strategies that apply the best available science for optimal permitting compliance. Our staff are ready to guide you through the complexities of federal and state regulations, giving you the knowledge and insight to plan and execute your project efficiently. Within the trenchless market, GeoEngineers has a particular expertise with United States Army Corps of Engineers (USACE) design and permit requirements for trenchless technology crossings of levees. This expertise is recognized worldwide and has made our firm a leader in geotechnical site characterization studies for pipeline crossings. Restoring natural habitat is an important part of our pipeline remediation projects. When a release of oil, gas, or industrial solvents threatens a natural ecosystem, we do more than just remove the impacted soil and groundwater. Our goal is to restore usable habitat, while satisfying stakeholders, and help our client stay in compliance with the relevant regulatory statutes. Our environmental professionals have worked to assess and remediate pipeline releases for pipeline clients. Our team methodically investigates, characterizes, and then remediates these sites through a range of methods that keep costs manageable for our clients, while mitigating any environmental impacts. GeoEngineers provides far more than geotechnical recommendations and trenchless design. We’re there every step of the way during project construction, working closely with contractors to ensure that the earthwork elements are constructed according to design recommendations and that hazardous materials are removed and categorized appropriately for disposal. We use our in-house data management software platform, Earth Analytics, to help us monitor and manage instrumentation for a variety of types energy infrastructure, including pipelines. From discrete, short-term monitoring to expansive networks of wireless instruments installed along the length of a pipeline and then tied into our software platform, we have the range of services to meet your needs.